Needle Tech uses contrasting lusters. Dynex SD Lustre employs high- and low-luster solution-dyed fibers to give the 100 percent loop construction the look of cut loop and create color, definition and texture. 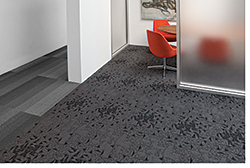 Available in four broadloom styles.